Newhaven port has fallen some way in importance and in maintenance since those halcyon days of the 1960s and, as these urban explorers discovered, the grade 2 listed former marine workshops are in a sorry state. Fifty years later, and just before the end of the final incarnation of SNCF’s ferry fleet as Seafrance, the crew of the Seafrance Rodin were captured at work. Not being in a position to mock others for their obscure interests, one can only salute Beno and his Youtube Elevator Tours. Whilst it is noted that the Pride of Burgundy has nice Lutz lifts, the reviewer is more impressed with the “really retro 80s Lutz lifts on the Pride of Dover”. Beno’s website also has some images of abandoned and decaying Folkestone harbour. 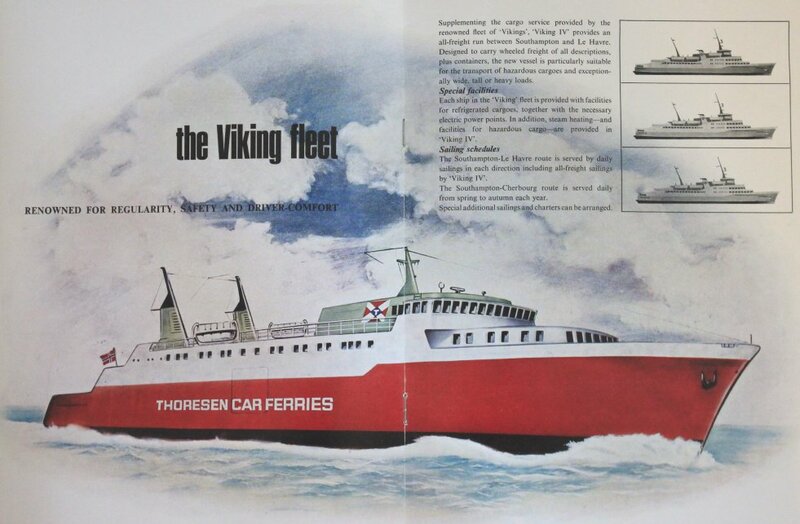 Thoresen’s overlooked freighter, the Viking IV, was a product of the Trosvik shipyard in Norway and she had a sister ship, the Mandeville, which was owned by A F Klaveness & Co, who would later become one of the three founder companies of Royal Viking Line. 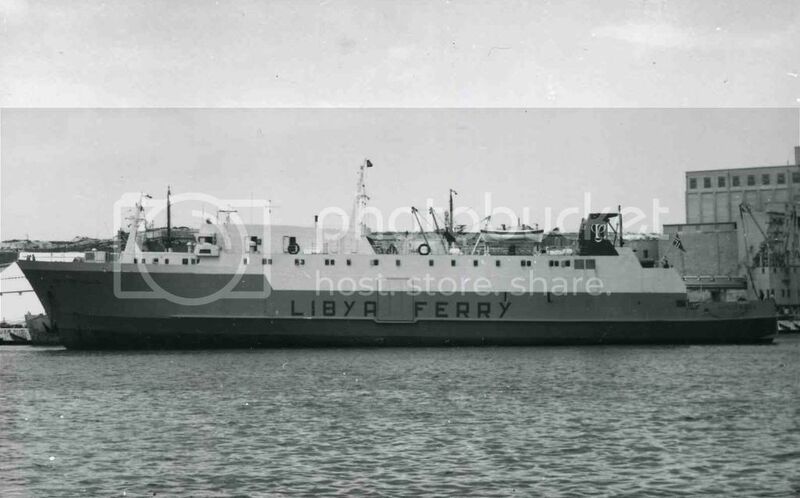 The Mandeville had an interesting career, tramping across the North Sea and seeing initial service on charter to Grimaldi and operating to Libya. Both ships ended their days as livestock carriers, the Mandeville as the Murray Express prior to being scrapped in the late 1990s. 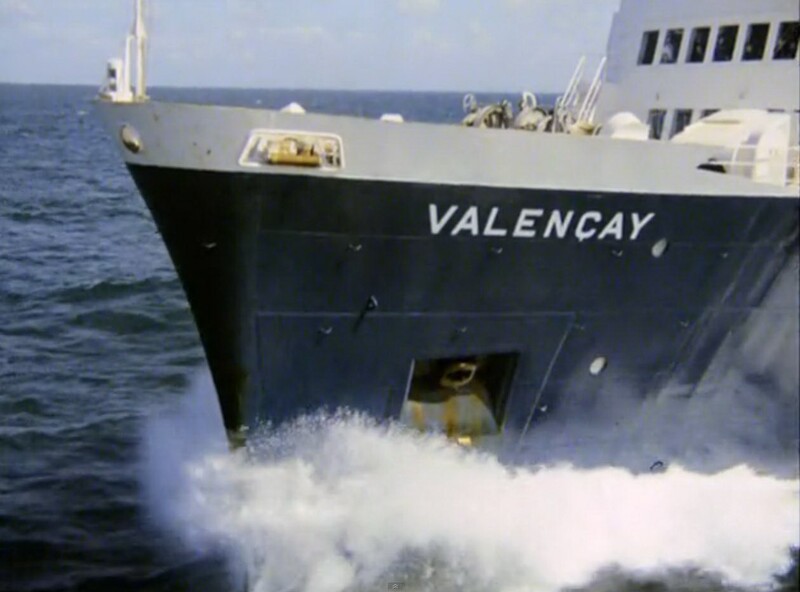 The Viking IV met her doom in more unfortunate circumstances: as the Guernsey Express she was caught by Super Typhoon Dale as it swept through the Pacific in November 1996. The ship sank, taking nearly 1,600 helpless cattle down with her in what became one of the most controversial reference points in the debate about Australia’s live export trade. Staying briefly with livestock carriers and it is interesting to see images of the Linda Clausen, which must be the only Cunard passenger ship ever so converted. Originally the Cunard Ambassador, the ship sufferred an on board fire when just two years old in 1974. 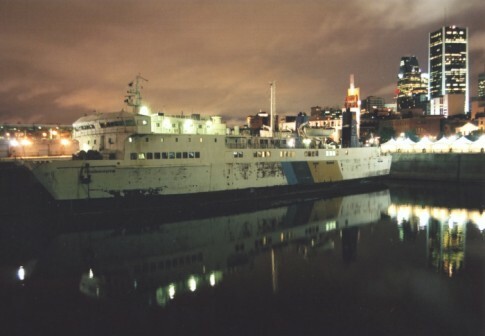 Declared a total loss, the wreck was rebuilt and served for a further decade before a further fire in the engine room saw her head for scrap in 1984. The fates of the three Wappens Von Hamburg continues to be played out. 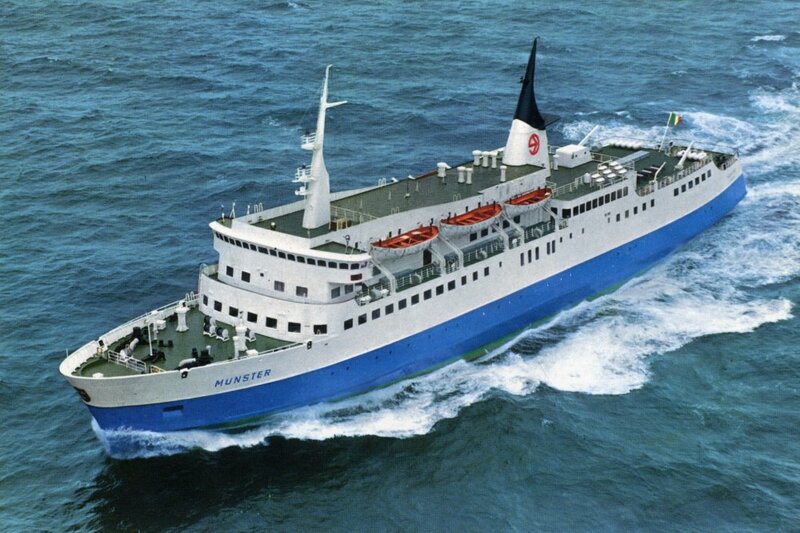 The trio were built as successive passenger ship generations in 1955, 1962 and 1965 for HADAG service to the small German archipelago of Helgoland. The youngest was the first and, so far, only one of the three to go for scrap. Here is a somewhat distressing video of the ship being demolished by a digger in Esbjerg. The first and second HADAG ships of this name survive but the future in each case remains uncertain. The 1955 version remains laid up in the United States, now under the name Aurora. Her owner’s website contains some more information, together with a plea for donations. The Wappen Von Hamburg of 1962, which briefly saw 1960s service with Stena as the second Stockholm-based “Jatten Finn”, soon returned to HADAG and remained with the company until the 1980s. She continued to serve Helgoland until 2000 but now finds herself named the Supper Clubcruise 2, laid up in Istanbul. The third “Jatten Finn” was Stena’s own Poseidon and this picture of the little ship is worthy of reference, if only for the oustanding backdrop. 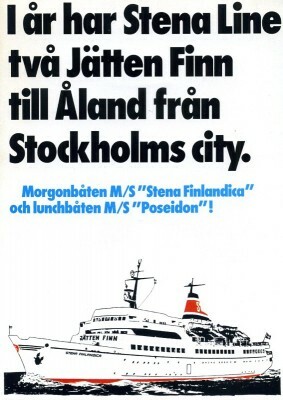 To complete the story of Stena’s early escapades in Stockholm, the very first ship to be bestowed with Jatten Finn titling was another HADAG ship, the Helgoland which was chartered in 1964. She returned to Stena in 1972 as the Stena Finlandica having been chartered in between times to the Red Cross for use in Vietnam as a hospital ship – in which guise she was covered in the harrowing 1970 documentary Nur leichte KÃ¤mpfe im Raum Da Nang. 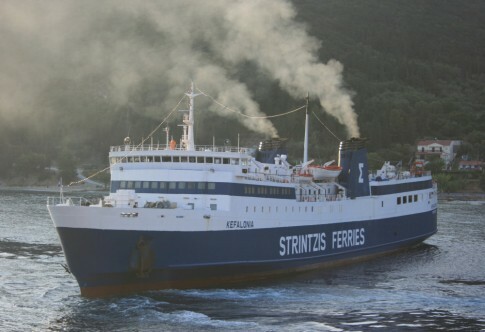 The Helgoland/Stena Finlandica survives as the Galapagos Legend. 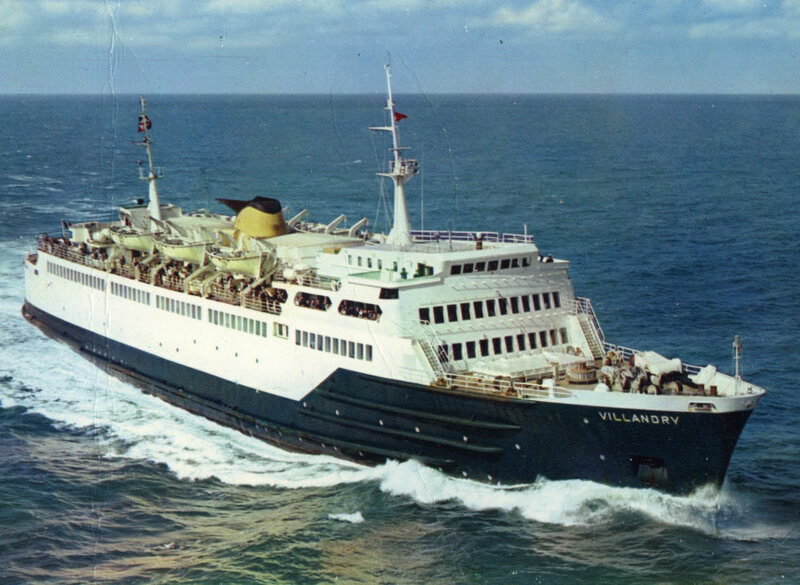 The same Esbjerg scrapyard which dealt with the 1965 Wappen Von Hamburg also scrapped five Wightlink ships in recent years, including the Our Lady Pamela. Time for a quick look inside the engine room of the Vitsentzos Kornaros (ex-Viking Viscount). The ‘Viscount’ also features in this collection of recollections from the Townsend Thoresen era. 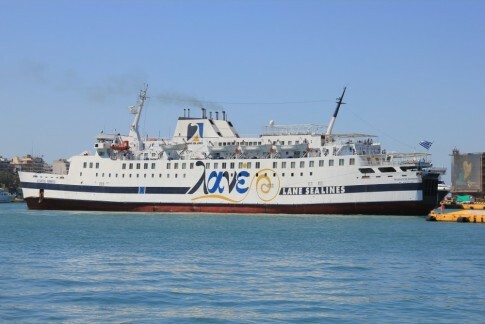 Michele Lulurgas has written a fine appreciation of his personal favourite, the Ionian Island (ex-Albireo, later Blue Island, Merdif 1) on the Adriatic & Aegean Ferries website. An intriguing image of the ship in her final guise can be found here. Car deck difficulties for the Penelope A. 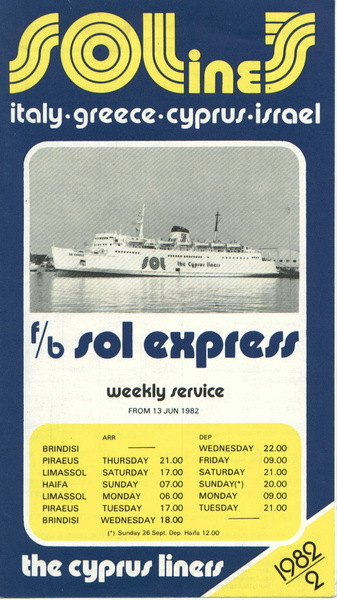 It is difficult to imagine any company which had a more interesting passenger ferry fleet than Sol Lines, the Cyprus Liners, who operated for less than a decade from the late 1970s. 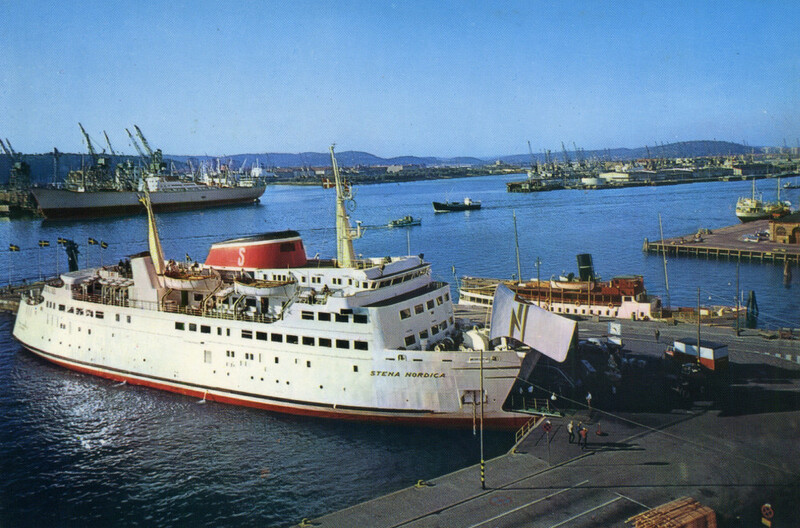 The company acquired second hand ships with all sorts of backgrounds, starting with the remarkable Sol Phryne, originally the 1948-built Taisetsu Maru and followed up with the Sol Express (Sealink’s Dover), Sol Olympia (the first Stena Britannica), Sol Christina (Trasmed’s Juan March) and Sol Olympia II (Trasmed’s Santa Cruz de Tenerife). The website of Solomonides Shipping has an excellent section which details the Sol Lines era. 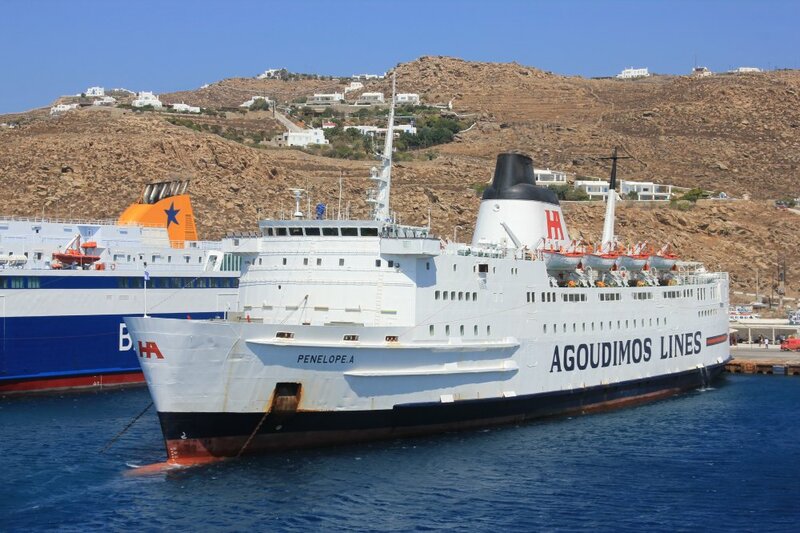 All ships are covered through the ‘History’ menu but particularly recommended are the pages covering the company’s general history, the Sol Phryne and the ill-fated Sol Olympia II which burned in dry dock in Elefsis in 1985 and brought the entire operation to an end. The Sol Olympia’s time as the Wickersham is remembered in this blog post. 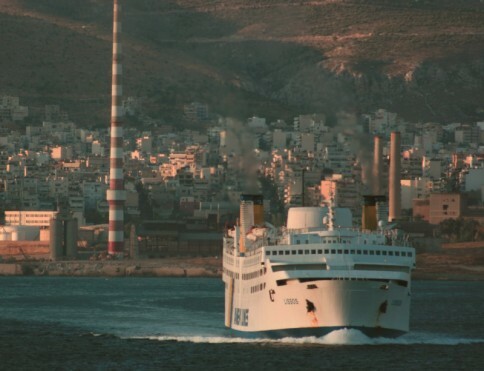 One ship which has survived a near-death experience is the 1962-built Ambriabella. For many years she could be found rotting in Elefsis as the Panic but a couple of years ago she was discovered by a group of Italians who sought to restore her as a luxury yacht. 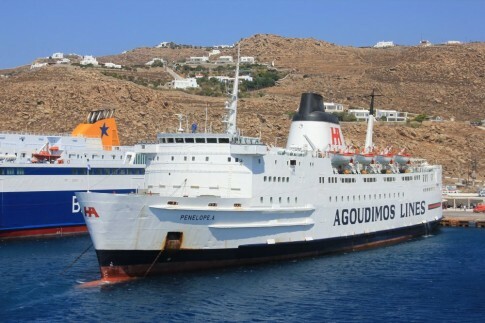 The ship was originally built for Italian north Adriatic coastal service before heading to Greece in the 1970s. 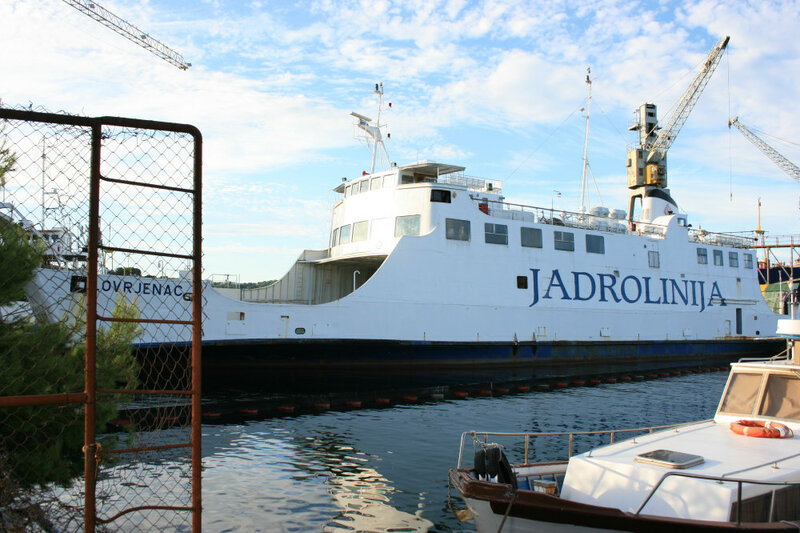 Her new owners have launched a website and restoration of the ship is planned to take place in Trieste. The sister to the Ambriabella is the Dionea and several years ago this ship was similarly converted to a yacht. The despatch of the Scotia Prince for scrap has provoked a fair amount of remorse in North America. The ship’s final period of operation in Europe saw her working for Marmara Lines in their final season between Italy and Turkey; she is seen here passing through the Corinth Canal. The first of seven interesting pages of archive of material relating to one of the Scotia Prince’s Portland-Yarmouth predecessors, the Prince of Fundy, can be found here (click ‘Next’ to proceed). The Nindawayma (ex-Manx Viking) was reported to be finally scrapped a couple of years ago. The ship lay unwanted in Montreal for seven years before being towed to Sault Ste. Marie where she lay for some time, although a certain amount of work was done to enable both stern and bow doors to be properly opened. 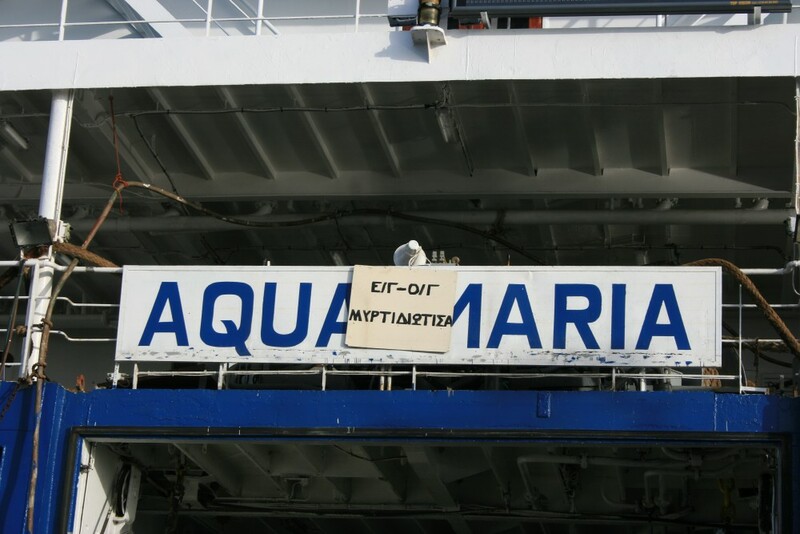 Fotunately, one astute photographer managed to completely document the ship as she was just before leaving Montreal. The ship depicted in the last video is the Sunflower 11 which went on to operate for the ill-starred Sulpico Lines as the Princess of the Orient for whom she sank in The Philippines in 1998 with the loss of 150 lives. Film of a dive on her wreck can be found here. The Hamnavoe is seen caught in heavy seas leaving Stromness. 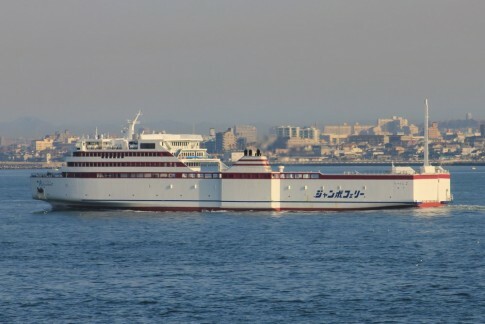 A difficult arrival at Mikura-jima for the Camellia-Maru. 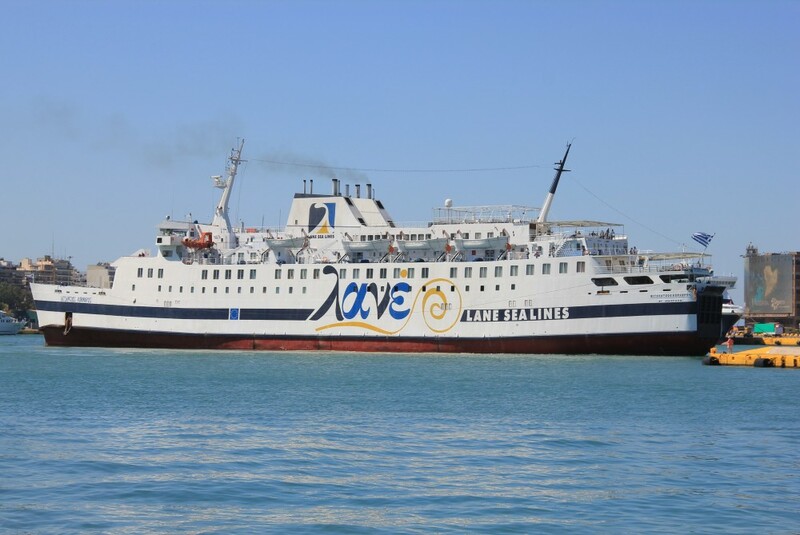 Rough weather for the Theofilos at Lemnos. The Corsica Express Three leaves a trail of destruction in Samothraki during her brief Greek sojourn. The Cruise Olympia in difficulties at Ancona. 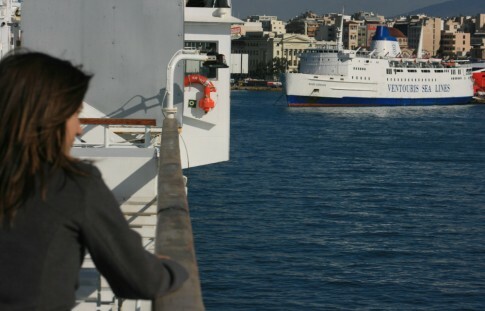 The Olympic Champion rolling into Heraklion harbour. A few hints on using the conditions to your advantage can be taken from the skipper of this small passenger ferry on the Mekong River in Thailand.